Opposition forces torched a historic church in the Syrian city of Homs today, where government officials are evacuating rebel forces as a part of a ceasefire between the opposition and government. 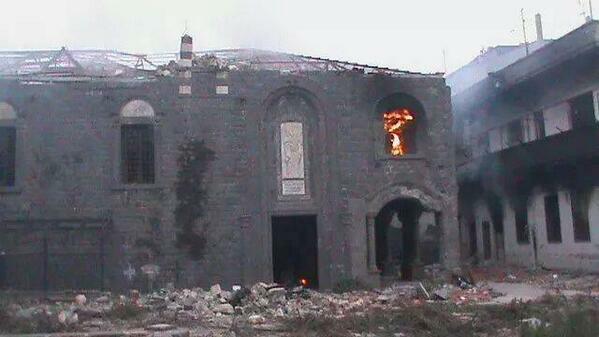 The Um al Zennar Church, also called Saint Mary Church of the Holy Belt, had previously been damaged in confrontations between the two groups in 2012, but as rebels exited the city today, they set the building on fire. Damascus-based Sham FM Radio confirmed the news and photos. Government officials took 1,200 rebels to dissident-held territory in the north. This is a part of the ceasefire deal struck last week between the opposition and President Bashar al-Assad’s government. Today marked a symbolic day in the three-year Syrian conflict as government officials evacuated hundreds of Syrian rebels from the historic city of Homs. This was the last rebel stronghold and was a strategic bastion in central Syria for anti-Assad forces. Today’s evacuation was a major victory for Assad’s regime.